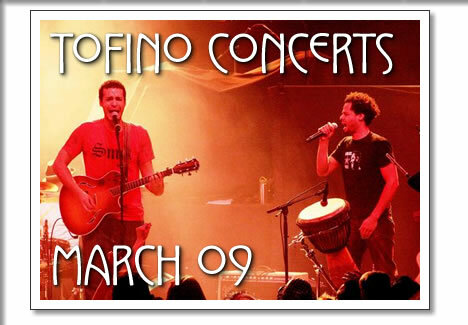 The following concerts in Tofino are happening in the month of March 2009. Tickets are available at Tofitian and Long Beach Surfshop in Tofino. Now in its ninth year, the West Coast Winter Music Series is planned and programmed by a dedicated group of volunteers who just happen to love music of all kinds, but classical music in particular. They are a non-profit group whose revenues are put back into paying the artists and providing travel and accomodation fees for them to perform in Tofino. For more information on tickets and or subscriptions contact Judi at 250.725.3373. A live concert celebration of music & whales! Juno-award winner & folk singer-songwriter Ian Tamblyn will perform songs from his new album release ‘Raincoast’ – songs inspired by Canada’s west coast. Local opening acts featuring great Canadian folk music. Tickets: $10 adults/$5 ages 12 & under/$25 family of 4 pass at the door or in advance at Mermaid Tales Bookstore, Hungry Bear Naturals in Tofino, and Wild Heather Books, Image West Gallery & Gifts in Ucluelet. Tina Jones' style allows for the traditions of souland r&b masters to meld with the provocative and intuitive techniques of jazz, hip hop, and deep house. Her reputation as a recording artist, entertainer and songwriter are recognized throughout Vancouver Island, the Gulf Islands, the Sunshine Coast and Lower Mainland music scenes. On stage and in the studio, she has the ability to execute breath taking vocal performances along with adept improvisational abilities on the trumpet, fluegelhorn, and piano. With a roster of talented musicians, the Tina Jones Band's dynamic is evident; communication, skill and flow are paramount. The sound result is funky with a jazz influenced nuance that satisfies not only the avid music appreciator but also gets people dancing with r&b elements. FREE Live Concert with Award Winning Children’s performers at Ucluelet and Tofino Maritime Kids Day. Fun & funky! Educational and outrageously engaging 4 piece live band including stand-up bass, drums and horns! Currently nominated for a 2009 Juno for Children’s Album of the Year! We are so excited to host them. All ages welcome. Musical percussion & gumboot dancing performance for all ages! Marimba Muzuva’s happy and hypnotic music has been a crowd-pleaser since the early 1990’s. Since that time the band has carved a prominent name for itself in the West Coast folk and world music scene by playing a wide variety of performances & getting audiences up on their feet! The music has a power all it’s own: vibrant, interactive, and percussive. Infectious melodies and pulsing rhythms of Zimbabwean music, hand-crafted instruments, visually dynamic performances, energetic dance… all in a spirit of celebration! Why do eager Canadian crowds gather to experience marimba music? What possible link could a group of musicians from Canada's wet and windy coast have with the exotic, sun-dappled music of Zimbabwe? The answer can be found in the music itself. It makes the world smaller, there becomes here, and everyone connects - with each other, with the rhythm of the earth and with the nurturing energy of the sun. In fact, it is impossible to hear the sound of the marimbas and NOT be transplanted to the sun and colour of distant land. Let’s go there! Live Band! WhaleFest Volunteer Thank you Shake-down! A Tofitian event. Ghost Brothers like to deliver their harmonious brand of music as a full band, and they also love to perform as a dynamic duo. Their sound has been compared to great musicians such as Michael Franti, Cat Stevens, Sublime, and Damien Marley with a dash of West African vibes. One thing that can be said for sure is that if you like to hear feel-good music and if you like to dance, then you will fall in love with Ghost Brothers. Born in Montreal, Canada, Rena Sharon began her life in chamber music at the age of eight. Her early studies were with Professor Dorothy Morton, and she continued her training at the Eastman School and Indiana University. Called "one of the finest musicians of her generation" and a "national treasure", she began concertizing throughout the United States, Canada, and Europe at the age of 19. In 1987 she was awarded "Best Pianist" diploma at the International Voice Competition of Rio de Janeiro. Among Canada's foremost chamber musicians, her performance spectrum also comprises solo recitals and concerti. Ms. Sharon is heard regularly in performance on the cbc national radio, and has recorded on the Marquis, Finlandia, Brava, Summit, Sono, CBC-5000, and Boston Record labels. A true grassroots success, Crowe is praised not only as a singularly talented songwriter and a visceral performer, but, also as a supreme interpreter of song. She tours steadily, earning a reputation for exciting live shows that stir together her original songs with much-loved interpretations in an organic blend of rock, jazz, folk, Broadway, gospel and soul. A fundraiser for the Westcoast Community Resources Society. In 1991, dancer/choreographer Veronica Maguire and flamenco guitarist Harry Owen, co-founded a successful school of flamenco in Victoria, B.C., Canada, as well as their own touring company, Alma de España Flamenco Dance Company. Today, Alma de España (Soul of Spain) is recognised as one of North America's finest Spanish dance companies.